All your taco filling favorites are here for the party in this big Layered Tex-Mex Taco Salad that makes enough to serve the crowd. 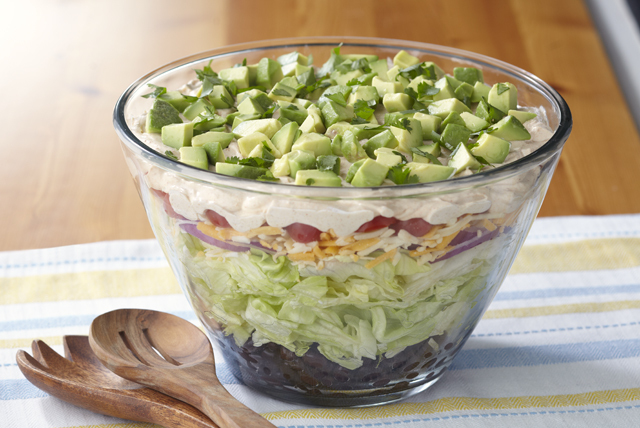 Layer beans, lettuce, onions, cheese and tomatoes in large bowl. Spread dressing mixture over salad. Chop avocado; spoon over salad just before serving. Sprinkle with cilantro. For a crunchy topping, substitute 1 cup bite-size tortilla chips for the chopped avocado. Save 30 calories and 3g of fat, including 1.5g of saturated fat, per serving by preparing with MIRACLE WHIP Light Dressing and KRAFT Mexican Style 2% Milk Finely Shredded Four Cheese.